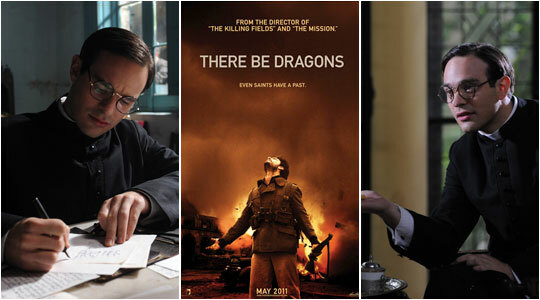 A summary of today’s show: Scot interviews actor Charlie Cox, who portrays St. Josemaria Escriva in the new film “There Be Dragons” and then discusses with Fr. Matt Williams, Fr. Chip Hines, and Karen Bohlin the themes of the “dragons” in our lives: Unforgiveness, selfishness, doubt, isolation, as well as the example of consistent virtue and heroism by Josemaria. 1st segment: Scot tells Fr. Matt Williams that this is the 40th broadcast of The Good Catholic Life. Today they discussed the new movie “There Be Dragons” which has strong Catholic themes. Fr. Matt said movies are important because they help us understand culture and life situations of different people. Scot said Cardinal Seán saw a screening of the movie a few months ago and asked the movie company to get in touch with Scot to do an episode of The Good Catholic Life on it. Fr. Matt said he had a sneak peek of the movie last July at a conference in Philadelphia. During today’s show, Scot gave away tickets for the movie, general passes for any showing at any theatre as well as tickets to a special premiere in Framingham tomorrow night. 2nd segment: Scot welcomes Fr. Chip Hines, who co-hosts a move review show on CatholicTV. He also welcomed Karen Bohlin, who is hosting several showings of the movie so her students can see it. Montrose school’s mission and vision are inspired by the life of St. Josemaria and the whole school community are excited by it. Karen said it will be relevant to young people because many of themes are applicable to today’s culture and society. Also, because it focuses on the early lives of the protagonists and the life decisions they have to make. There Be Dragons is an epic action-adventure romance set during the turmoil of the Spanish Civil War. The story traces the lives of two young men, Josemaria Escriva (Charlie Cox) and Manolo Torres (Wes Bentley), childhood friends who are separated by the political upheaval of pre-war Spain to find themselves on opposite sides as war erupts. Choosing peace, Josemaria becomes a priest and struggles to spread reconciliation by founding the movement Opus Dei (work of God). Manolo chooses war and becomes a spy for the fascists. He becomes obsessed with a beautiful Hungarian revolutionary, Ildiko, who has joined the militia in pursuit of passion and purpose. But when Ildiko rejects him out of love for the courageous militia leader Oriol, Manolo’s jealousy leads him down a path of betrayal. As personal and national battles rage, the characters’ lives collide and their deepest struggles are illuminated through the fateful choices they make. Each will struggle to find the power of forgiveness over the forces tearing their lives and friendship apart. Scot played an interview with Charlie Cox that was taped earlier. Scot asked him what interested him in playing the role. He said he’d not heard of St. Josemaria before getting the script from his agent. What attracted him to the film the most was the director Roland Joffe, who directed The Mission and The Killing Fields. He was struck that Joffe was a kindhearted and generous man. Scot asked him what he did to prepare for the role as a priest who is now a saint in the Church. A few weeks before going to Buenos Aires where the movie was shot, he flew to Barcelona, Spain, where he met a historian and an Opus Dei priest to visit the places in his life, his birthplace, the seminary he attended, and then on a retreat where they talked about Josemaria and spent time living the life of a priest who would be on retreat. Walking in a cassock was one of the trickier things to learn. They spent a lot of time in meditation and prayer, praying the Rosary and doing the Way of the Cross. They helped him to become familiar with the man and his time in which he lived. Much of the film takes place during the Spanish Civil War. What does Charlie hope that people will see in his portrayal of Josemaria? He said there’s no one moment in the film or even in Josemaria’s life in general where you can say, “This man should be canonized.” The power of the film and his life is that his life is filled with consistently selfless decisions. It’s the way he faced the adversity and dealt with it that make Josemaria and extraordinary human being. What the film tries to show is that the time of the civil war was a time of confusion, anger, hatred and fear. It is a country torn apart. At one point the character of Manolo says, “I don’t know who I’m fighting anymore.” There was a time when the hatred was aimed at the Church and priests in particular, and to be known as a priest in Madrid would invite being shot. Charlie hopes people will see how Josemaria dealt with that time, not engaging in hatred and taking a side, but instead spread a message of love, forgiveness, and peace. Scot said there is a time for us today when we have to make “dragon” decisions. What message can we take away in the year 2011? Charlie said because it’s so hard to tell a story about the Spanish Civil War, what you end up with is messy hate-fueled conflict, which is what war ends up being anyway. So the Spanish Civil War can be substituted for any conflict. In the movie, you see two characters: one makes consistently selfish, fear-based decisions for his life and the other who recognizes the temptation to make those decisions selfishly and angrily, but chooses to not do that. Scot said he takes away that there is a little bit of Josemaria in each of us and a little bit of Manolo in us. Charlie said that is exactly it: we should see a little bit of them in each of us and ask ourselves who we want to be. Scot said it is unlike typical saint movies, but it much more epic in scope. Charlie said his hope is that the film reaches everyone, who sees the story of a man who had an incredible journey and an incredible life who made a series of decisions that led to his canonization after his death. He expects the majority of the evidence to be Christians and Catholics, but there is a story and a message here for everyone regardless of religious beliefs. Even if you don’t learn anything from the way he is portrayed, it is still a great story to be told and to be entertaining. Scot said there are many resources the production company built for good family conversations and good parish discussions. What are Charlie’s hopes for what the movie will lead to for people? He said he thinks that Josemaria was asking for people to look inwards. Rather than look at the world and point out all the things that are wrong and all the things making you miserable, instead look inside and see if we’re engaging in self-centered fear. Or are we looking to serve others and love God. Even in his life today, it’s easy to feel like the victim and become miserable and depressed, but what Josemaria says is that in those moments, see what you’re contributing to the world and to others and see what you might give to them. In the film, Josemaria says to his early followers: “Before trying to change the world, think about changing yourself.” It’s hard to do. Scot said it can lead to peace. Charlie added that if everyone lived like that, think about the kind of world we’ve be living in. 3rd segment: Back live, Scot asks Karen and Chip about the interview. Karen said those who have seen the movie already, including the school’s chaplain who knew St. Josemaria, say that Charlie’s portrayal of him is very authentic. Fr. Chip said Charlie’s face is very expressive in this performance and does a very good job. Much of acting is done through the face. Fr. Chip said one of the scenes that was well done was a birthday party and when Josemaria gets his new shoes, you see the authentic joy and the humanity of the saint comes through. Charlie Cox was able to convey the holiness and the humanity of the person. Scot said it’s good to see holiness and sanctity as achievable by living in a very human way. Fr. Matt said right from the beginning when Manolo and Josemaria were just eight years old, you see how Josemaria was a boy just like us. The movie’s tagline is that every saint has a past and future and you can see that in this portrayal of Josemaria. Fr. Matt said the great teaching is on the life of virtue. What we see is this life of selfless decisions. Karen said character is not just good behavior. It’s about striving everyday to do everything with greater love and affection, not just to beef up a resume, but to serve others and God. They teach this in their school, that students should do everything they do with their utmost. Josemaria knows heartbreak from childhood and carries his demons with him through the movie and there’s no sense that he meets God and all that goes away. She said in many ways the movie is more artistic than a traditional action drama. Fr. Matt said it’s a great point that holiness and sanctity doers not remove us from the turmoil of daily life. Do the dragons of the past shape who we are or do we acknowledge them and name them and love God and move forward in holiness and sanctity. Fr. Chip said it’s a key point that saints are regular people and Josemaria was certainly a regular guy. This search for holiness is everyone’s quest and everyone’s journey. He remarked how people often at funerals say that if they didn’t have faith, they don’t know how they would get through this. Some people are always looking for big giants signs, but their faith sometimes fades quickly. But the people who live a quiet solid faith often remain steadfast throughout life. Karen said she liked the way Josemaria was so loyal to Manolo throughout life. He stays in touch and reaches out to him in the most difficult moments in life. Even though Manolo rejects him, he is hurt, but says he will always be there for him. Josemaria is also a very real son and brother to his family. He evinces a love for freedom, but he also preaches forgiveness. He has an immense capacity to remain faithful to Christ’s call to forgive your enemies. Joffe is taken by the those who can forgive and love under difficult circumstances. 4th segment: It’s time to announce the winner of this week’s WQOM Benefactor Raffle. Our prize this week is a set of passes to the movie “There Be Dragons.” This week’s winner is Frank Lawrence from Warwick, RI. Congratulations to Frank! 5th segment: Scot asked Fr. Chip what he thought of the character of Manolo. He said it’s someone you’re rooting for to change himself. You can see the good Josemaria is striving for an achieving, while Manolo makes bad decisions at every turn. The actor portrayed it well. Seeing it on film, makes one think about his own life, the decisions we make, and whether we can change. Manolo never thought he could change. Scot said that everytime something bad happened to him, it just added on to the grimness he was showing. Karen said Manolo is wounded from childhood because he is never loved by his father. While he has wealth and material means, while Josemaria doesn’t, he envies Josemaria’s relationship with his father. He makes bad decisions as an adult, and while his conscience struggles, he doesn’t see away back from the consequences. She thinks he’s riddled with fear and the pursuit of happiness through power and conquest, but it doesn’t satisfy. Scot said theme of the effect of fathers on sons is important here. Fr. Matt said he thinks of the scene where Josemaria’s baby sister had died and he is angry at God. His father, who is in tears, embraces his son in love. There are no platitudes. It is symbolic of how Josemaria became a father to Manolo. Roland Joffe says the theme of the movie is reconciliation and how it sets us free before it sets free those we forgive. Karen said the producers have released testimonials from people who had seen the movie in Spain. One couple had been on the brink of divorce, and after the movie they sat in the theatre in tears and said the dragons were not in themselves. They agreed to not divorce after all. Another young woman had been unable to forgive her mother for a betrayal and after seeing the movie she was able to let go of the poison of the bitterness she had held against her mother. Even Joffe himself was able to reconcile with his mother as well. Scot said every character in the films deals with whether to forgive or keep themselves in their miserable state. Other dragons in the movie are selfishness, doubt, and isolation. Fr. Chip said another theme is every father in the movie through their relationships with their children helps or hinders the characters’ ability to have a relationship with God our Father. Fr. Matt said forgiveness is a grace. To err is human but to forgive is divine. When people massacre your family or colleagues or priests, we cannot forgive in our humanness, but it must come from God. We must manifest faith in love to everyone, even if they’re wrong. No one is free of human weakness. One of Scot’s lines from the movie: “The only thing that is unforgivable is unforgiveness.” The movie makes you think about the people in your life that you need to forgive, the dragons that hold you back from being the best person you can be. Scot said another theme is heroism and one of the reasons Josemaria is so inspiring in this movie. Karen said that before being heroic you must grapple with doubt. In the movie, characters wrestle with doubt about God or self or others, but what’s heroic is to be reach out in faith to God. Josemaria risks his life to bring the sacraments to the people. While churches are being destroyed and priests being killed, he is hiding and celebrating underground Masses. Fr. Chip said that is one of the best scenes in the movie. Karen said Josemaria’s call to his vocation is heroic. Fr. Chip said that while it’s not a vocation story, it can inspire vocations because it shows the priesthood in a heroic life. Once can find the heroism of everyday life in how priests serve every day. Fr. Matt said it’s doing little things with great love. Bl John Paul called Josemaria the saint of the ordinary. Josemaria shows us that that virtuous life is a happy life. Fr. Chip said the movie is re-energizing for the priestly life. That will conclude today’s presentation of The Good Catholic Life. For recordings and photos of today’s show and all previous shows, please visit our website: TheGoodCatholicLife.com. You can also download the app for your iPhone or Android device at WQOM.org to listen to the show wherever you may be. We thank our guests Father Chip Hines and Dr. Karen Bohlin. For our co-host, Father Matt Williams, our Production team of Rick Heil, Anna Johnson, Justin Bell, Dom Bettinelli, and George Martell, this is Scot Landry saying thank YOU for listening, God bless you and have a wonderful evening!